This year it is 20 years ago that Volvo released the 850 T-5R. Time to celebrate ! In 2004 the dutch Volvo 850 Club organized a meeting to honor the 10th birthday of the T-5R. A huge line-up of Cream Yellow, Black and Green Volvo’s was the result. This year we like to beat the record of the most T-5R’s in one meeting. Therefore every owner of a T-5R is invited to join the party. 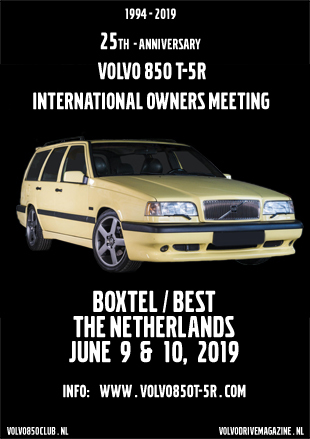 And of course everybody else (Volvo owner or not) is welcome to be part of this meeting and enjoy the company of so many enthusiasts from everywhere. It’s not exclusive for the Dutch neither. Where ever you live abroad… you’re very welcome !! According to an early publication in a dutch magazine the T-5R’s ended up all over the world. Since we are expecting guest from far we have made it a two day party. Saturday we gather around noon and start with a tour through one of the nicest areas of the Netherlands. It’s not only for sightseeing, but we can gather points too in answering questions and showing skills. When we successfully ended the tour we’ll be back at our meeting area where the fires for the BBQ already will be lighted. After a good meal we’ll start our evening program. What this will be is still a secret. After a good night rest the gates of the meeting area will be opened very early. A team of enthusiasts will point the arriving T-5R’s to the line-up and navigate other Volvo’s or other brands to the huge parking lot where they can park type by type. At the meeting area a lot of things will happen. Lot’s of presentations. At the bar/restaurant they will sell food and drinks. And with the sun at the clear blue sky it must be a very nice scenery.. A record T-5R’s lined up. Estate by estate. Sedan by sedan. Color by color. Check the information pages to read more about the location, the program and hotels / camping grounds in the area.